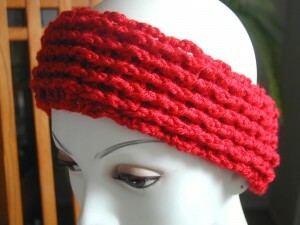 This cozy ear warmer will keep your fingers busy and your ears warm as a result! You will have to know the Front Post Double Crochet (fpdc) and Back Post Double Crochet (bpdc), and then you’re good to go! It is a good pattern to use up your scrap yarn. Mix and match colors – you can even use 2 strands at once for a pretty effect. If you want, you can add a trim with single crochet in eyelash yarn (the fuzzy stuff) to really dress it up! Gauge: No gauge needed. Use instructions within the pattern to adjust the size if desired. Finish off leaving long end of yarn (about 12 inches). With yarn needle, stitch ends together. 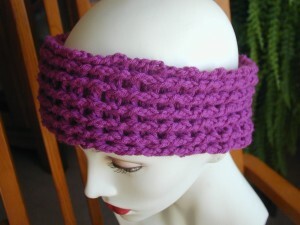 This ear warmer was crocheted with raspberry acrylic yarn and can be used as a neckwarmer too! If you have any questions about this pattern, please don’t hesitate to ask. 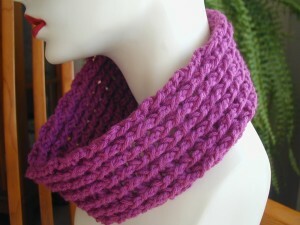 This entry was posted on Friday, February 18th, 2011 at 1:00 PM by Robin Beers	and is filed under Free Crochet Patterns. You can follow any responses to this entry through the RSS 2.0 feed. You can leave a response, or trackback from your own site. I love it as a neckwarmer. of scrap yarn in different colors. So we’re fpdc in the bpdc, and bpdc in the fpdc, right? It looks ok so far… just checking! Michelle, that’s right. Just keep alternating across. You should see the ridges appear. Let me know how it comes out. Robin, I love the look of the ribbing! I’d like to make a scarf using the same pattern, but wanted to verify first: your starting chain is simply multiples of two plus three? Laura, yes, that is correct. Good luck with the scarf! I am a beginner and I am gonna try this. Let me make sure I understand. For row 2, *fpdc in next st, bpdc in next st, repeat from *, means doing fpdc and bpdc 6 times? Also, are you supposed to fpdc in next stitch from chain 3 and bpdc in the next stitch from fpdc? Hi Stacie, yes you are going to have a total of 6 fpdc and 6 bpdc. When it says to work into the next stitch, your first stitch will be made into the stitch after the ch 3, and the next stitch after that will be made into the stitch right after the stitch you just worked into. You’ll see that the ridges created from the stitches will start to line up. Thank you, I love it! and the pattern is really clear. is there a way to edit a post?